This South American species is commonly sold as T. palmeri but this is now treated as a synonym. 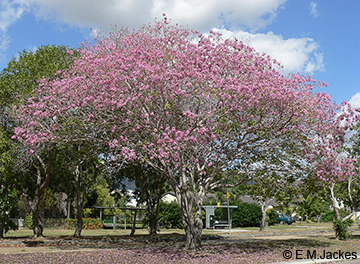 This deciduous or semi-deciduous tree is often seen as a street tree in Townsville. It is spectacular in spring when the tree is leafless and covered in large clusters of very pale pink to pink frilly flowers and there is a carpet of pink on the ground. The compound leaves have 5-7 leaflets, digitately arranged, and the margin is usually somewhat toothed. In this species there is a distinct contrast between the pink of the petal lobes and the yellow throat which tends to become pink with age. Capsule has thick smooth valves and may be up to 56 cm long.